TEA PARTY CHALLENGING GOP OLD GUARD…….. – The Tundra Tabloids……. 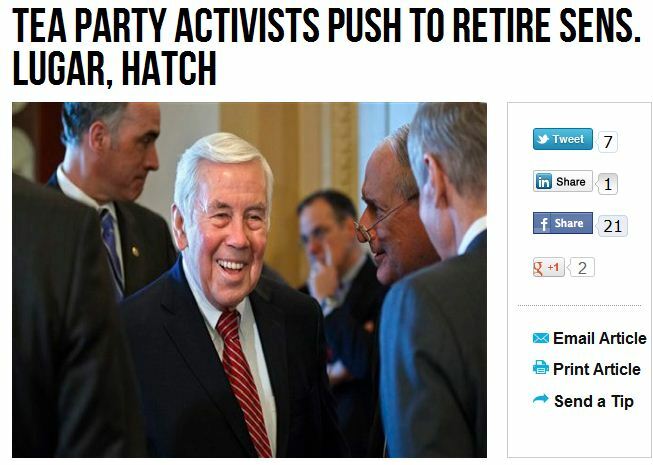 TEA PARTY CHALLENGING GOP OLD GUARD……..
IMHO, Sen. Richard Lugar, from the state of Indiana, is fair game for the Tea Party, he’s a RINO and a true Washington insider, who loves to be liked by his supposed opposition. The same can’t be said or Sen. Orrin Hatch. All politicians have some legislation under their belts that they’re not too proud of in retrospect, but this is a US senator who has pushed conservative causes all his career, and in this time and juncture in the country’s history, he’s needed. Lugar on the other hand…adios. Sen. Richard Lugar sounded wistful in his gratitude when he thanked supporters packed in the skybox of the Indiana Pacers’ home court, as though he could see the approaching end of a political career that has spanned nearly half a century. “I thank all of you, the 50 or 60 of you who are co-sponsors of the rally. We appreciate very much your willingness to put your own names on the line and be helpful in bringing together this assembly,” said the 80-year-old Indiana Republican who was first elected to the Senate in 1976. That characteristically understated demeanor has endeared Lugar to generations of Hoosier voters. It belies the fierce battle in Republican circles over whether to retire him now or give him six more years in Washington. Lugar and Utah’s Orrin Hatch, 78 and sent to Capitol Hill in the same year as Lugar, are tea partyers’ top Senate Republican targets for defeat this year, portrayed as old bulls out of touch with today’s conservatives. They are the GOP’s two most senior members in the Senate. Next Post Next Post CATALONIA SPAIN AND IT ALMOST HALF A MILLION POPULATION OF MUSLIMS……. Just for starters, Hatch supported not only amnesty, but also a bill to convey amnesty within Utah. One of the single-most devastating issues we have is the millions of illegal aliens in this country (I’ll spare you the redundant reasons). Hatch wanted more of them. Enough said. His time has come. Hatch, McCain, Graham, and all of the RINOs must go.